So you’ve finally made the decision to move. Now comes all of the other many decisions that need to be made. The first one may seem like a simple one: should you move yourself or pay for full-service movers to pack up all of your belongings and move them to your new residence for you? Doing some research and checking options first is a good idea, because you may not be aware of all the different options you have. Depending on how much free time you have and how flexible your schedule is, you can pick an option that works best for your busy lifestyle. Full Pack – Packers come to your home and expertly wrap and pack all items. Boxes are labeled to ensure they arrive at correct location. Partial Pack – Packers will pack one item, one room, or entire home, depending on your specific request. Unpack – Packers come and unpack for you, putting items away as directed or as labeled on the boxes. There are many ways that you can combine your own labor with professional services, which will save you both time and money. A full-service moving company can do all of the packing and unpacking for you, or will work with you while you do some or all of the packing yourself. 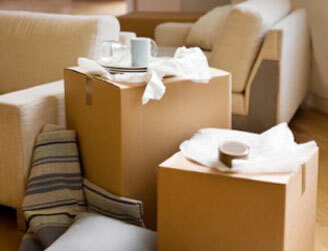 The ideal situation is to relinquish as much of the moving job as possible to the professionals. If you have it all hired, your home and its belongings will remain intact and living in it will not feel like a “war zone”, with belongings scattered or packed away while you still need them, such as cooking utensils, pots, pans – and of course – personal items and clothing. Moving professionals are also trained and experienced in packing all items, including large and fragile hard-to-move items such as pianos, mirrors and heavy pieces of furniture. You won’t have the added worry of those items getting damaged or broken during the move. They will label each box and what room it is to be moved to. Professional movers are experienced in packing and are quick, safe, and efficient. They can pack up your household within days, whereas it may take you weeks or even months to pack up your own household. It’s all about finding the right balance for your situation. The good news about moving and all the decisions you will be making is that you have plenty of options. BB&D can work with you and offer the right amount of assistance for you. This entry was posted in Uncategorized on August 7, 2017 by BB&D Editor.